Simple simple simple! Yet so very tasty! This is also a very versatile recipe, you can add just about anything you want. I needed to make this as a vegetarian option so mine was pretty basic. Just skewer your desired ingredients, make a basic pesto sauce, pour over the skewers and chill overnight. 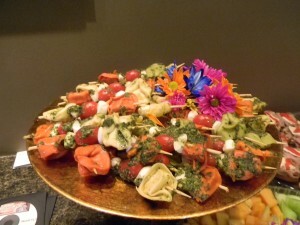 Its a very beautiful appetizer and sure to wow any crowd! Skewer on desired ingredients. I used tomatoes, mozzarella and tri color tortellini. You can certainly add other items like artichokes, salami (or other meats) etc. To make the pesto add all ingredients except the olive oil into a food processor. Start the processor and drizzle olive oil in a steady stream. Keep adding olive oil and checking texture to assure it doesn’t get too oily. It should not be a thick paste, but shouldn’t be too liquidy either. Taste pesto to assure theres enough seasoning. You can add lemon juice if desired. It does help the pesto from turning color. I did not add any since I have an allergy to citrus. Be careful with salt since the parmesan will also add saltyness. Pour pesto over skewers. Cover and chill overnight. All you have to do next is place on a pretty platter and serve!